We are very sorry to hear the news that Alan Fletcher has passed away…. We are very sorry to hear the news that Alan Fletcher has passed away. Alan worked on the fruit and veg stall on Ilkeston Market. He also worked occasionally at John’s News and as a barman in some local pubs. Earlier he worked as an operative at Stanton’s Concrete plant. He was known locally as Gay Alan and ‘Maradona’ because of his mop of dark curly hair. Many people have paid tribute to him on social media, typical comments being ‘wouldn’t hurt a fly’, helpful, very polite and friendly. He once ran from his market stall to help save an elderly person in the path of a reversing vehicle. It seems he died at home. Alan’s mother Elsie used to attend the Salvation Army in Chapel Street and after she died, Alan started attending too. 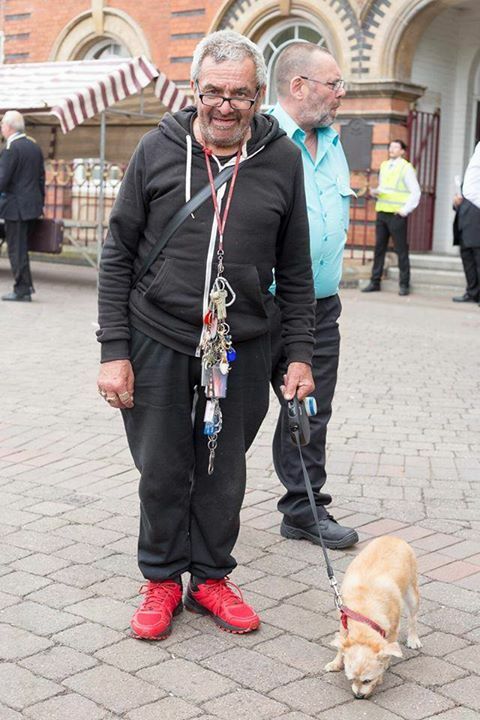 He was one of Ilkeston’s characters who will be missed by many people. Our photographer took this picture of him with his dog only recently at the Beating Retreat ceremony at the Market Place.